Idle games has come up as a genre on a lot of podcasts lately. Because apparently it hit the point where they defined the genre, and also these games are available on Steam instead of just in browser or on a phone where they belong. It got me thinking about how popular the genre must be to hit that “legitimate” level on Steam. My problem is that I tire of these games after one decent session. The 2nd session is nice because you come back and see all the work that was done without you, but why keep going? I mean I keep going for at least 2-3 days, but it still falls into a genre that I would never spend money on. Then, I move on, forget my lesson, and try the next clicker game in a few months. 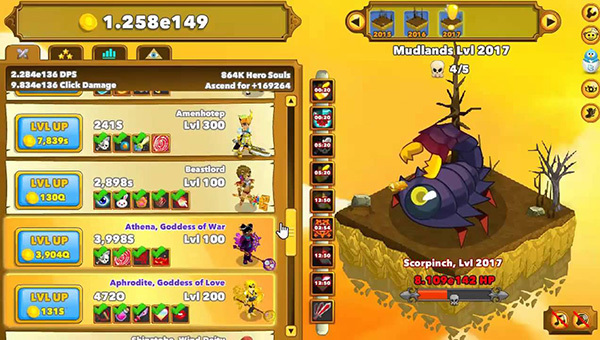 The addiction is undeniable, and games like Clicker Heroes show how far the genre has come since Cookie Clicker and there is actually some nice art/animation/character design in these games. It definitely deserves to be taken more seriously and at some level how different is this game than Diablo/Borderlands? Play those games on easy difficulty and really you are just navigating the world inbetween clicking/shooting on enemies. I still think there’s has to be some end game for these idle games. The “loop” just isn’t doing for me. I’m always impressed by the amount of content that is crammed into them, but after that 3rd or 4th session there almost needs to be a branching path. Who cares? Clickers do what they do and they only seem to be getting more popular without me or *shudder* with me.